The Amazing Cocoa Powder [recipe] – Cin Cin, Let's Eat! For three years now, I’ve been a loyal reader of the Bon Appetit magazine. I learn something new from each issue . In the February 2011 issue, there was a feature on cocoa powder that really caught my eye. I always have a jar of unsweetened cocoa powder on hand, but I never know what to do with it besides making hot cocoa or the occasional sprinkle on sweets and coffee. Thanks to this new revelation from BA magazine, I have discovered just how rich and decadent cocoa powder is, and it’s so easy to use. I didn’t have to deal with melting, tempering, double boiling chocolate, and wash a gazillion pots and pans. The best part? I can control the exact sweetness of my chocolaty dessert. 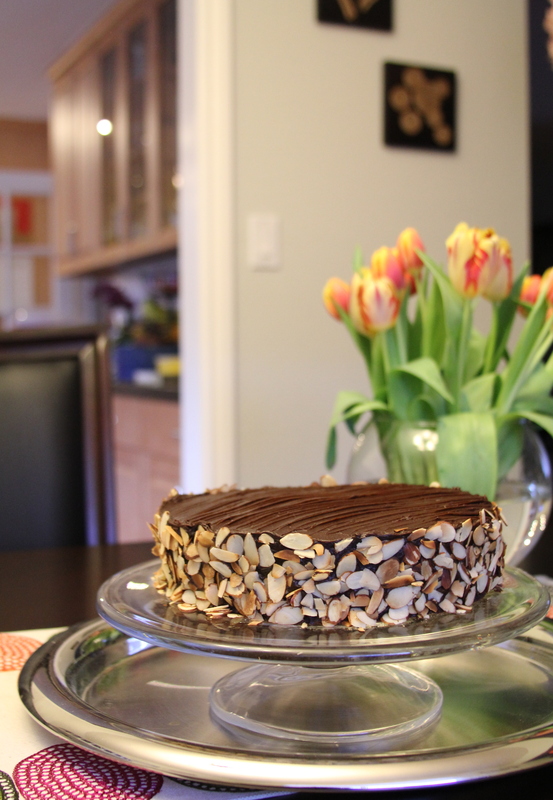 I chose to make this cocoa layer cake for an afternoon get together with my besties. This is a very straight forward recipe, and the result was simply…WOW! It’s light and moist. 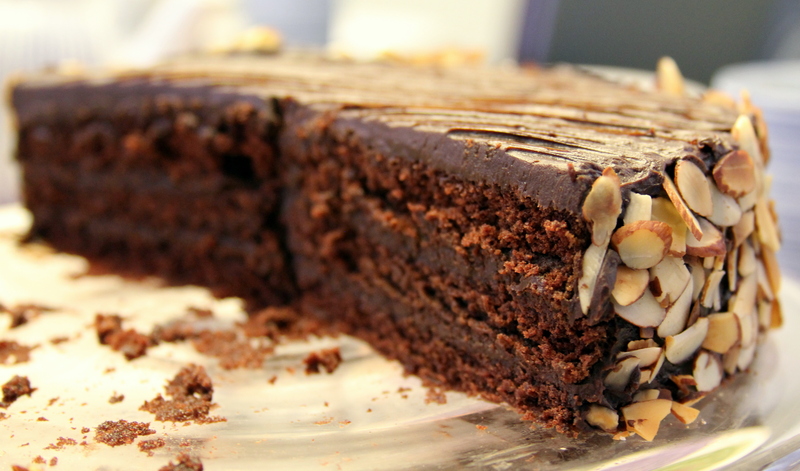 It’s decadent yet isn’t so rich that makes you want to stop after half a slice. I gotta warn you though, BEWARE of that frosting! I first tried it just to sample the taste. Before I knew it, I made quite a dent in that bowl of addicting goodness. The layers are supposed to be thin. It’s a low-rise cake, there is no baking powder added to the cake batter. As always, I reduced the sugar in the recipe. For the cake: 3/4 cup sugar and 1/2 cup packed golden brown sugar. For the frosting: 1 cup packed golden brown sugar. For the frosting, I added a splash of Kona coffee liqueur that I brought back from Maui. I just love the flavor of coffee and chocolate together, they help to bring out each other’s flavors as well. You can also use liqueurs like Kahlua (coffee), Tia Maria (coffee), Grand Marnier (Orange), and Frangelico (hazelnut). Lots of possibilities here! Be careful when heating the frosting. 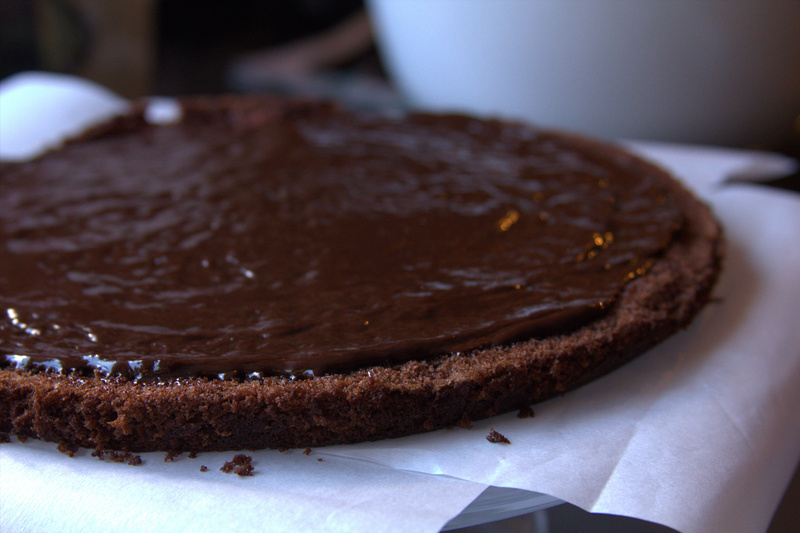 When it gets overcooked, the oil seperates from the chocolate. When the frosting cools down, it will look grainy instead of silky. 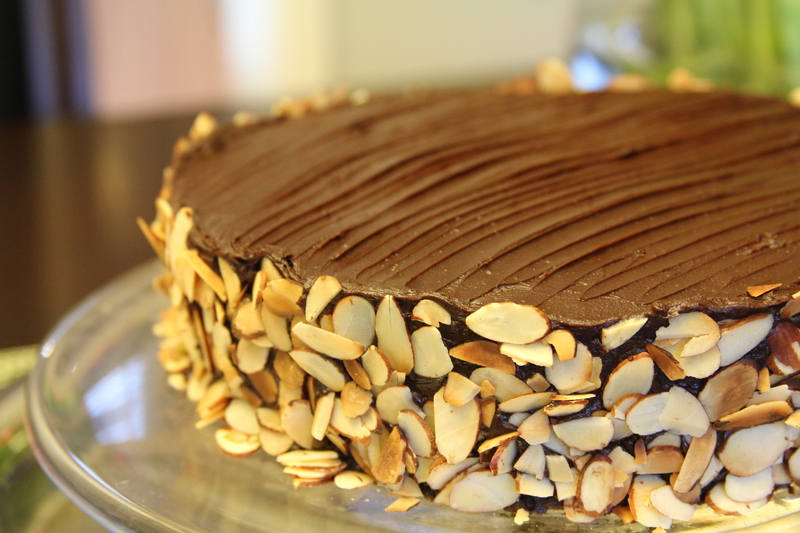 I toasted some almond slivers, and coated the sides of the cake for extra crunch. I made this one day ahead, and kept it in my trusty cake carrier.